FURTHER, to provide all of its services, to all people of the community, without prejudice. ALL MEMBERS are called upon to fulfill to the best of their ability, the mission of Miami Township Fire and Emergency Medical Services and the duties of a good emergency services member, abiding by the Constitutions and Laws of the United States of America and the State of Ohio, and the rules and regulations of Miami Township Fire and Emergency Medical Services. 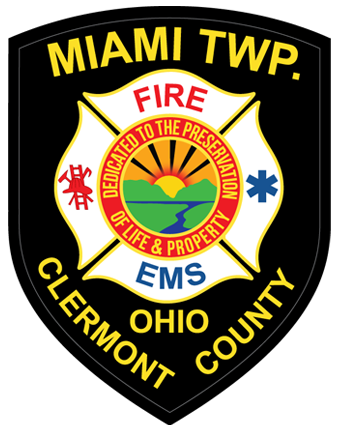 The Miami Township Fire and Emergency Medical Service located in Clermont County, Ohio, is the branch of township operations providing fire, rescue, and emergency medical response. Miami Township Fire/EMS employs 51 full-time employees supplemented by a dynamic group of part-time and volunteer personnel. Currently 45 of the full-time personnel work a 24 / 48 hours shift system where they are on-duty for 24 then are off-duty for 48 hours. The other full-time staff is administrative, working normal business hours. All personnel are required to be cross trained to a minimum State of Ohio EMT-B, and State Certified Fire fighter. Additionally, all full-time personnel are required to complete an intense six week Fire Academy course and all newly hired employees are Ohio Paramedic Certified. We also employ an administrative assistant at our headquarters. The service operates 4 stations which are manned 24 hours per day, 7 days per week. Our fleet consists of 4 primary engines, 1 tower, 1 brush fire unit, 4 advanced life support ambulances, 1 supervisor vehicle, 2 chief's cars, and 3 staff/utility vehicles. All engines are equipped with advanced life support equipment, generators, gasoline powered fans, foam, and rescue cutters/spreaders. Our run volumes have risen steadily as the population of the township has increased. A sample of the services provided by us include fire rescue response, emergency medical treatment and transport, fire safety inspections, public fire education (schools and business), fire hydrant maintenance, juvenile fire setter education and counseling, senior citizen safety programs, and CPR / first aid programs.